Right in the middle of Vacation Mecca that is Panama City, is this wonderful little Exotic and Endangered Nature and Botanical Park. A true respite from the cement jungle in the surrounding areas, this park is 7 acres filled with over 200 species of animals. For an up close and personal look, there are 3 wildlife shows, "Parrots in Paradise", "Going Wild", and "Wolf Encounter". We saw the Wolf Encounter show, and it was really interesting how they looked just like domesticated dogs, but they are, indeed, wild animals! 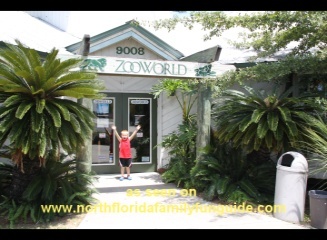 We enjoyed Zoo World's Petting Farm, with a barn and surrounding animal pens, everything was very clean and well kept, and the animals looked very happy and healthy. They even had a Giraffe, and a Dromedary Camel! Venturing down the path there are exotic animal exhibits of the Jaguar, Tigers, Florida Panther, and African Lion. I got the chance to have an up close visit with an African Lion. This amazing creature was resting in the shade just 3 feet from me through the fence! The lion really is such a magnificent animal, and really big too! Bigger than I had thought! Then when it growled, everyone jumped up a few inches off the ground! Zoo World has a brand new playground area for kids! Conveniently located next to the snack bar, this large and wonderful play structure is a welcome addition for kids of all ages to get some exercise! Built on a large sand base, and surrounded by shaded areas to sit, this is a great place to hang out for awhile, grab an ice cream cone, and take in the scenery. I liked the large bird exhibits, with plenty of open spaces for the parrots to play and interact with each other. The two parrots I took pictures of, looked like they were in love and posing for the camera! It was adorable. They have the Tilghman Hospital right there with windows to peek in and see how the animals are doing. They also have an animal restaurant there, the zoo food preparation area, with a large window for kids to view the animal chefs working hard putting together the fresh animal cuisine prepared on a daily basis for the park's animals. Bryan loved the Meercat Exhibit, which had a crawl through tunnel with windows on it,running through the Meercat play area, so he could see up close and personal what it would be like to be a Meercat! Zoo World has many interesting events throughout the year including a summer camp program for kids, an annual Zoobilee Festival, and a Halloween ZooBoo adventure for safe Trick or Treating October 31st! You can even have a birthday party here! This park was very clean, and nice, and hosted many different types of animals to view up close. Fun for kids and families!